In the mass media and the blogosphere,both inside and outside China,commentators have been discussing the differences between the cultural segments of the Beijing and London ceremonies as representative of two opposed political systems. However, one very important point has been missed by Western observers concerned about what they perceive as a growing threat to their way of life: the Chinese leadership and populace do not generally perceive the Beijing ceremony as the beginning of the rise of their authoritarian system in the world. Rather, it was the pinnacle of a system which they would like to leave behind. When China returned to Olympic participation after a 32-year absence, they were exposed to a new kind of ceremony. The Hollywood-style cultural segment in the 1984 Los Angeles Olympics stimulated a public debate about whether socialist mass calisthenics were appropriate for China in the era of reform. Choreographers began adding “artistic” elements to national opening ceremonies, but despite 25 years of debates, mass calisthenics still constitute the core of opening ceremonies. If parts of Boyle’s ceremony were a jab at the conservative right in Britain (a Conservative Party member of parliament provoked a controversy by tweeting that it was "The most leftie opening ceremony I have ever seen — more than Beijing, the capital of a communist state!”), then Zhang Yimou’s ceremony was a jab at the conservative left in China. Six days after the ceremony, he provoked controversy inside China by observing to Southern Weekly that Westerners were incapable of mass calisthenics “because of human rights.” He explained, “They have all kinds of institutions, unions. We do not have that, we work very hard,we can eat bitterness and endure hard labor. … I think other than North Korea, no other country in the world can do this.” Since North Korea is regarded negatively inside China, this could only have been understood as something of an insult. It may be that the inimitable scale of the Beijing opening ceremonies will be a tipping point in the history of government-run spectacles and collective exercises in China, with all they imply. On the Chinese internet, perhaps the topic that recurred the most was money. Significantly, on this point there was a high degree of consensus, even between the few extreme comments in either direction – whether nationalists derogating London, or critics of China. Among the comments on a blog on Sinaby Olympic reporter Yang Ming, there was criticism of the money spent in Beijing: “The money that was spent was the money of the common people; did the common people agree to it before it was spent?” Another observed that in London, “Missing was the Chinese-style waste, paying no attention to whether the country’s people live or die, nothing but grandeur and splendor – what damn use is that?” There were defenders of Beijing, including the internet opinion leader, professor Zhang Yiwu, who argued that it was appropriate for China to use an impressive spectacle to host its first Olympic Games and mark its emergence as a great nation after a century of arduous struggle. Hosting its third Olympic Games, London did not have this need. 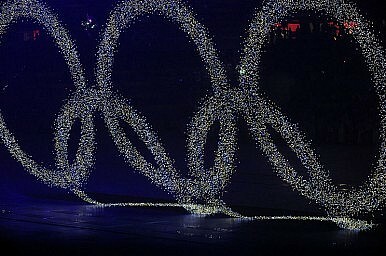 Coverage of the Beijing Olympics was estimated to reach 70% of the world’s population; London might reach even more. The opening ceremonies are providing global citizens with a common talking point about political systems, and the internet is increasingly opening up a space for discussion across national borders. There is still not a lot of interchange between the Chinese-language and European-language blogospheres, but we have a start. The result is a more sophisticated understanding of political systems and a surprising number of shared viewpoints about the obligations of governments to their people, how they should spend their money, and their future orientations. In today’s increasingly connected world, the Olympics may be bringing us closer than we think to a global consensus on keypolitical issues. Susan Brownell is Professor of Anthropology at the University of Missouri-St. Louis. She has been engaged in Chinese sports since she was a Chinese collegiate track and field champion in the 1980s, and is the author of Beijing’s Games: What the Olympics Mean to China. Events in London have sparked strong discussion among Chinese citizenry concerning a whole host of issues.